I love spicy food – therefore , I have a burning love for jalapeno peppers. I like to figure out new ways to use these peppers and I am sharing three today! 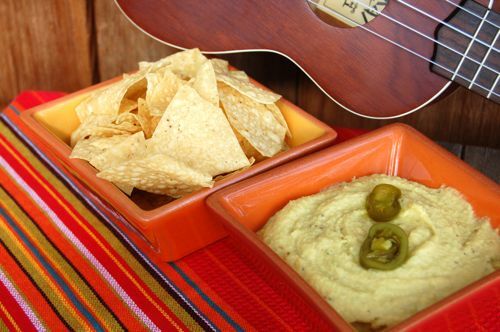 First up, I mixed my Greek background along with my love for jalapeno peppers to create jalapeno hummus. It has subtle heat and is delicious. You can add dish to start any menu. I serve this hummus with either corn chips or pita chips. 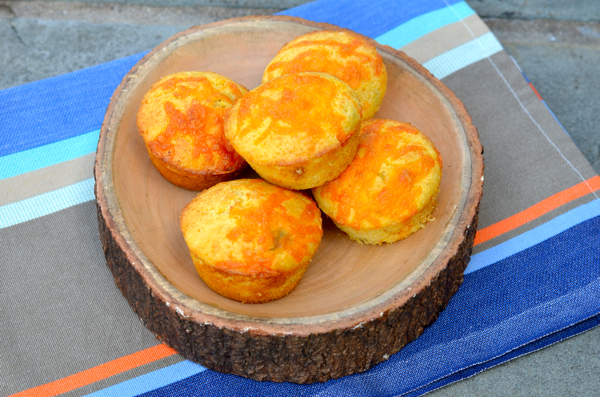 Next up are my southern biscuits kicked up with cheddar and jalapeno. This is a perfect basic biscuit recipe that is easy to make and very easy to get creative with. Last up or jalapeno rounds dredged in corn meal and fried. I always keep a jar of jalapeno rings in my pantry. These rings fried up make a perfect appetizer for any one with a burning love. They are also great used to kick up the taste of your favorite burger or sandwich. I suggest you work on trying all three of these recipes soon. From by the bay wishing you the hottest food memories! Place all ingredients into a food processor and process until smooth. Serve cold or room temperature with corn chips or pita chips. Preheat oven to 450 degrees F. In a medium bowl, mix flour, cornmeal, baking powder and salt. Cut in shortening with a fork until the mixture is crumbly. Next mix into the bowl the grated cheese and jalapeno. Slowly stir in the milk until you have a dough that can be kneaded in your hands. If you need more milk add a tablespoon at a time until the dough is formed. Turn dough out onto a lightly floured board and knead a few times. Roll dough out to a half-inch thickness and cut out biscuits with a biscuit cutter. I use a 2 inch round. 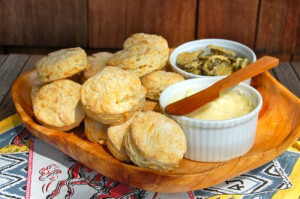 Place biscuits on a ungreased baking sheet. Bake for about 10 minutes. Serve warm or at room temperature. Heat oil in a medium size frying pan. Place cornmeal on a plate and dip each ring all over in the cornmeal. Place rings into the hot oil and fry quickly and turn while frying, no more than a minute is needed to brown the rings. Place onto paper towel to drain. Serve immediately. This entry was posted in appetizer, Bread and tagged biscuit recipes, cheddar cheese recipes, cheese recipes, cocktail party recipes, hummus recipes, jalapeno recipes, southwestern recipes, spicy recipes on May 23, 2014 by entertainingbythebay. Preheat oven to 350F. Butter 2 – 5.75 by 3 inch mini loaf pans. In a large bowl combine well these dry ingredients: flour, salt, cornmeal, sugar and baking powder. In a separate medium bowl combine and beat milk, eggs and butter. Pour wet ingredients into the bowl with the dry ingredients and stir well. 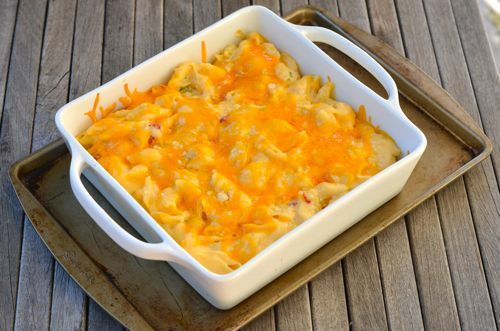 Fold in the cheese and scallions using a spoon. Pour the batter into the mini loaf pan. Place pans onto baking sheet and bake for about 35 minutes until the tester comes out clean. Cool on metal rack for 10 minutes. When cool remove bread from pan. 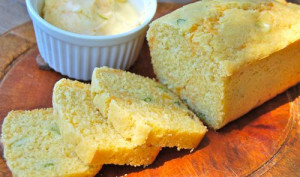 To make butter, place softened butter , salt , lime zest and cayenne pepper . Combine well. Serve with sliced cornbread. This entry was posted in Bread and tagged cheddar cheese recipes, cheese recipes, citrus recipes, corn bread recipes, corn recipes, lime recipes, southern cooking, southern recipes on May 23, 2014 by entertainingbythebay.